The progressive group The Neal Morse Band is kicking off a US tour in January 2017. The first show will be in Neal Morse’s hometown of Nashville on January 14. Our date here in Atlanta is February 4 at the City Winery. A full list of tour dates is available on their website. 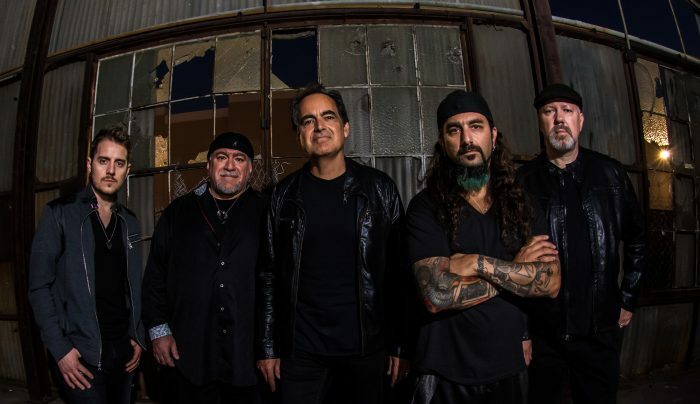 The band consists of Neal Morse (lead vocals, guitars and keyboards), Mike Portnoy (drums and vocals), Randy George (bass), Eric Gillette (guitar and vocals), and Bill Hauber (keyboards and vocals). You may have heard about their new album, Similitude of a Dream, released November 11, 2016. TAM has already put out a review of the excellent album, and the upcoming tour will be in support of the album. Later this year, they will be a part of Cruise to the Edge, a cruise ship experience featuring a veritable who’s who list of progressive bands, led by the legendary Yes. Neal’s first solo album after leaving Spock’s Beard, Testimony, is going to be re-released on vinyl in the March timeframe. Also, Morsefest 2015 live recordings featuring the Sola Scriptura and ? albums are set for release later this year. Target Audience Magazine: I want to talk first about the new album, Similitude of a Dream. I’ve listened to it a few times, and I think it is one of the best things that you have put out yet. I was wondering if you had any general thoughts about the album you’d like to share? Neal Morse: I’m really just thrilled about how it all came together. I feel like it was orchestrated, from a higher power, you know. I just think it’s amazing how it all came together. I’ve been thinking about how important it was that it be a double so we could have the themes recur. Most of the important themes occur three times or so throughout the album, and you can really only do that on a double. So, it worked out really amazingly well, and I feel blessed to be part of it. TAM: “The Pilgrim’s Progress” is quite a big piece of literature, it’s about the size of a George RR Martin novel or so. It’s quite a big story that you guys decided to tackle. I was glad to realize that instead of trying to cram the whole story into an album, that you guys instead just started at the beginning and got as for in the story as you could get, and I think you guys did a great job. Is there any chance that you guys would consider a follow up, to finish up the story? NM: It’s possible. I mean, there’s so much material in there. That was when I realized that it was going to have to be a double CD, was we were a half an hour in, and the guy had barely left the “City of Destruction”. NM: You read the book, and there are so many characters, and so many things that happen to him, there’s just no way you can cover it, you know, on one disc, at all. In fact, this whole double disc only really covers some 60-70 pages of the story I think. TAM: Right, it seems like of part one of “The Pilgrim’s Progress”, it gets about halfway through or not quite halfway through. But I think it was a good decision to try to tell the story from the beginning instead of trying to cram it all in there. NM: Yeah, well I think we had a little help, and I’m thrilled about that. TAM: When you got the idea to try to do this concept album based on “The Pilgrim’s Progress”, had you already written any of the music, or did you develop that in tandem? NM: I was starting to write; how it started for me was I was feeling compelled to write last December , and I went into the studio and started playing the piano and writing little bits on the guitar and I felt like it needed some direction and I remembered that someone had suggested that I do an album based on “Pilgrim’s Progress”. And I thought, you know what, I don’t know that much about “Pilgrim’s Progress”, I should go check it out. And so I looked up the notes because I didn’t own the book and I never read it. That was when I started to just take some of these ideas and sing things over them that were related to the “Pilgrim’s Progress” story. I remember I began to sing things like getting out of the “City of Destruction”, and going back to the City, and even a bit of “Broken Sky” I think. I can’t remember now – I’d have to look back through my notes – but that was how it started. But I wasn’t sure if that was something that the band should do, or if it was something for another time. It wasn’t until the band put their hands to it that I realized it was definitely the way we should go. TAM: So everybody in the band was on board with the concept from the beginning? NM: No, not really. I think at the very beginning, the first writing sessions that we had were in January , and that was with everybody in the band except Mike [who was on tour with the Winery Dogs at the time]. I think, you’d have to ask them, but it seemed to me that the band was a little bit indifferent about it, but we were all on the same page the wanted to do whatever was the right thing for us to do. So we just started exploring this thing. We weren’t sure we were going to do it for sure, but we just started exploring it, and that was when it all started to fall together with some of the ideas I had and some of the ideas that they had brought to the table also. But Mike was very much against – when we got together with him in March, he was definitely against it. He wasn’t against doing a concept album, but he was against it being a double for sure. So that was really a problem. But eventually, he changed his mind, he saw the light, and the rest is history. TAM: I remember reading about the band’s prior album, The Grand Experiment, that you went into the sessions with very little prepared material beforehand, which was a departure for you. Did you repeat that process again here and write as a group? NM: We did, but it was a hybrid of a lot of different things. We worked from these ideas I had sent from my phone. I recorded all those little snippets, ideas onto my phone and sent them to the guys. And so we worked from some of those, and then there were some other ideas that they brought in that we worked from also. The song “Ways of a Fool”, for example, Bill had actually submitted that song for the Grand Experiment album, and we adapted it to this album, and I kind of reworked the lyrics to fit the story of Pilgrim’s Progress, and made it from the perspective of the worldly wise man. It’s amazing how well it fell together, it’s just incredible. TAM: I also like how you guys are handing off all of the different vocals responsibilities in the different songs. It’s nice to have different people’s takes on parts and things. I think you guys did a real good job with all of that. NM: Oh thank you! Yeah, that was something that we all agreed that we wanted to do more and more, was to include everybody’s voices. That was something that was very important to us from the get go. We really liked the way we did it on the Grand Experiment album it was really cool and we wanted to do more and more of it. TAM: I think it comes off really well. Okay, so let’s switch gears and talk about the upcoming tour. We’ve got a date here in Atlanta for early February, but the tour kicks off in earnest in January? NM: Yeah, we’re starting January 14 in Nashville at Rocket Town, and I just can’t wait to get out there and play this album. We’re gonna do the whole album in its entirety. At the places where it works to have video behind us we’re gonna have that too. It is going to be an incredible experience, not to be missed. TAM: That was going to be my next question, was whether or not you plan on playing it cover to cover, it is very exciting that you guys are gonna do that. The album is not quite two hours in length, so will you guys pull out some other material, maybe for an encore, for some of your shows? NM: Yeah, sure, yeah. I’m pretty sure we’ll have an intermission and some encores as well. TAM: So it will be the five core band members, do you have any other supporting musicians for the tour? NM: 5 core band members, man. We’re doing it. We’re gonna make it happen on our own. I think it’s gonna be amazing. TAM: That is great, I’m really looking forward to that here in Atlanta. So for setlists, then, I guess if you are going to play the album cover to cover that kind of takes care of the typical set list creation duties right? NM: [laughing] Right, that’s true. Yeah, the only thing we have to argue about is the encores. Not that we argue about it that much, but you know. TAM: I was going to ask if that is a group effort if if any particular member tends to own that, how do you guys determine what you are going play? NM: Mike is usually very involved in the set list. He’s really good with it. You know I’ve always believed in honoring people’s gifts. When people are gifted in a certain area, you know, let the gifted man work. Mike has a wonderful gift in that area and so we often try to, you know. I don’t always do everything he thinks is a good idea, but a lot of times. TAM: Yeah, Mike seems to have a good understanding of the big picture a lot of times. NM: Yeah, he’s really good with that stuff. TAM: I know it is fairly obvious when you have a concept album based on the Pilgrim’s Progress, and I know many years ago you became a Christian, and I think it is awesome that you’re able to do that and still bring our music to the world. So when you guys are out on tour, do you try to find and attend church services and things while you are out on the road? NM: I do sometimes, yes I do. The last time I had a day off in Philly, I remember going to a church there. Yeah, I sure do. We’ve all gotta stay prayed up, we gotta stay full. Yeah, it’s a challenge.